The Dummy Curve is a curious concept most salespeople have never heard of. Yet it is extremely effective in lowering the natural skepticism and other barriers of the prospect. We must accomplish this during the complex sale if we're going to have a true conversation. Remember, if we don't find out anything about our prospect's world, we probably won't make the sale. 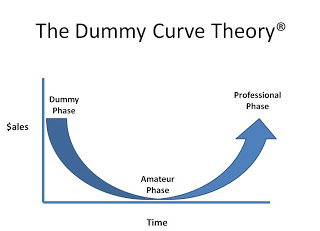 What the Dummy Curve pictures is the accidental ease with which a new salesperson makes sales...then the trouble selling once they begin to mature in the role and collect knowledge of features and benefits...and then the potential return to effective, productive selling by consciously practicing the very methods they used at the beginning of their career. Technical knowledge about the product or service you offer can block you from making sales. As soon as you drop into the technical patter, your prospect tunes out. You may feel comfortable, because it's comfortable to know and share technical facts; however, those things are not why prospects buy. Prospects buy because their underlying needs or wants are met. Sometimes this can happen because somewhere in the blast of features and benefits coming from the salesperson is hidden the one thing that satisfies the prospect's hidden need. But wouldn't it be much more effective to deliberately uncover that need or want, so we can take it out into the sunlight, turn it around and really know what it is? Especially since our competition will be using the features-and-benefits firehose? The secret to the Dummy Curve is in questioning. We revert to being a newbie in our sales role on purpose, and ask the "dumb" questions a new salesperson would ask. And in doing so, these hidden needs and wants of the prospect pop to the surface without resistance. A fictional character--a police detective--is fully competent with the Dummy Curve and this kind of deliberate questioning. Yes, the rumpled, seemingly-bumbling Columbo. Watch here as Columbo disarms his suspect by his apparently disorganized manner, "reaching" for questions, and literally going away and coming back--things you can do as a salesperson. The suspect views Columbo as an amusing annoyance. 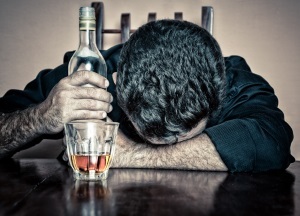 He shakes his head in disbelief that the detective could ever be closing in on the truth. A salesperson who is genuinely interested in helping the prospect, rather than just making the sale, will ask questions that uncover why the prospect wants to buy. Doesn't that sound incredibly simple and right? Yet what do salespeople with a dash of technical knowledge do? Revert to "show up and throw up" with those features and benefits! Columbo is genuinely interested in solving the case. And the effective salesperson is genuinely interested in helping the prospect. 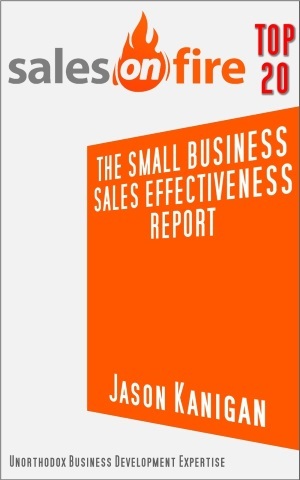 How have you been conducting your sales conversations?